So I had started a new tote bag a few months ago, but just got too busy to get finished. So for snow day #2 (yesterday) I got it finished up! Yeah! So I am not a pro-sewer or anything, just like it as a hobby for fun. 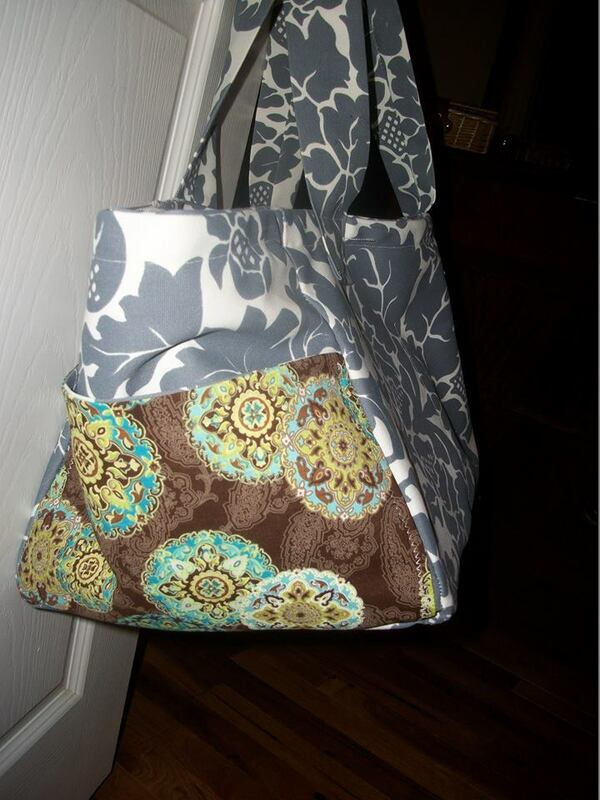 This bag that I make is a great beginner project though, you could even leave off the pockets if you wanted. 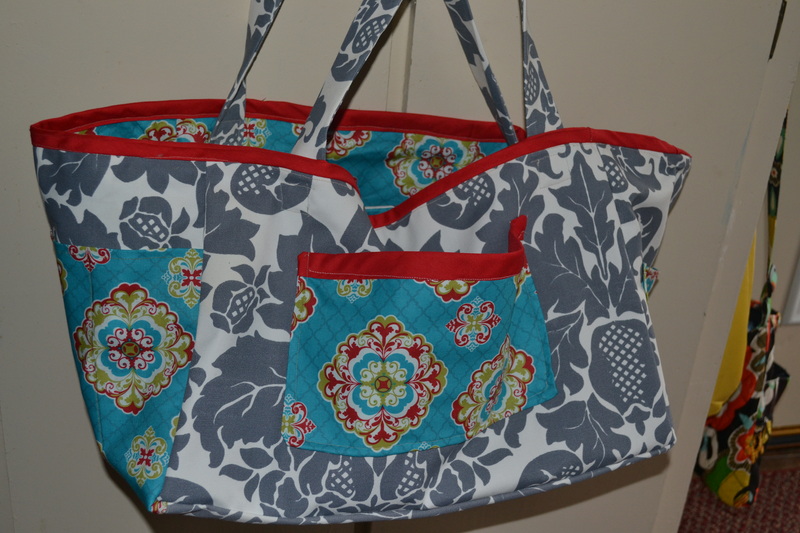 I add pockets to the inside as well as the outside. 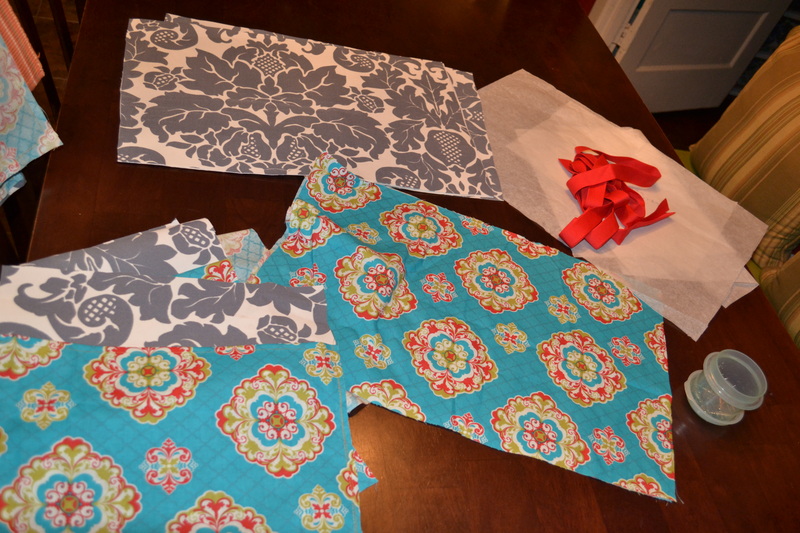 It starts with just some rectangles cut out of 2 different fabrics, the grey and white fabric is a heavy canvas and the colorful print is just plain cotton. The red is just some binding tape I bought at Hobby Lobby. The 2 straps are just made from the canvas fabric. I made a “pattern” out of a thin white craft paper. The long sides are 12″ x 18″ and the short sides are 12″ x 12″. For the straps I cut 2 pieces 30″ x 4″ and just folded in half and sewed up, then turned the right side out. Then it was ironed flat. Here are the pieces all cut out! I cut out one whole set of the grey and white and one whole set of the blue printed fabric. I used 2 of the print and 2 of the canvas for the liner and for the outer shell. I make my bag have a liner, so that it is double thick and also looks nicer inside the bag. I just sew the outer shell and turn right side facing out, then for the liner I sew and turn with the wrong sides (seams) facing out. I set the liner down into the shell and sew together at the top edge. Here is the inside liner getting pieced together. All pockets are added before sewing this together (I forgot to take any pics of the pockets being placed on here) For the inside pockets I add a 18″ x 8″ long pocket along the long sides, then sew it into 3 smaller sections. Great size for a water bottle, sunglasses, etc. You can really add any size pockets you like. 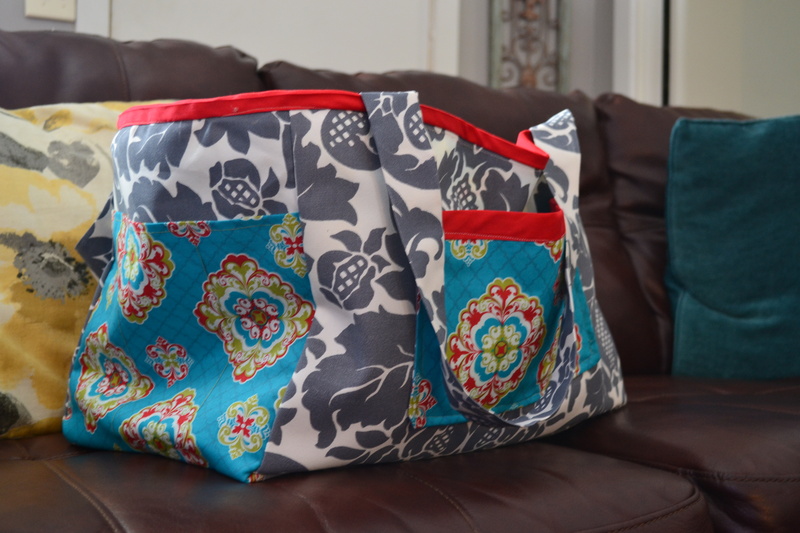 I add a few smaller pockets to the outside ends of the bag as well, they were 12″x 8″ and just a smaller one on the other end around 8″ x 5″. I topped some of the pockets with the red binding tape, and some I just turned under and hemmed. You could make this bag smaller, I like a large tote to carry all my junk, but it is a rather large sized bag. Hope all are staying warm and safe in this nasty weather! And if you live where it’s nice- lucky you! We are now on day #3 of snow days, and I am ready for summer already! Have a blessed day ya’ll! May you find a blessing today and pass on a blessing for someone else! Okay so I made another flag, this one monogrammed with an R for my mother in laws’ birthday. It turned out great and she absolutely loved it. For this flag I measured 12″ x 18″ for the burlap part, then I used some heavier cotton fabric (that I found in the remnant section marked down) and cut 3″ x 12″ strips, one for each end of flag. I then used my Cricut cutter and cut out a 6″ R onto cardstock. I then traced the R onto the back side of the printed fabric and cut out. 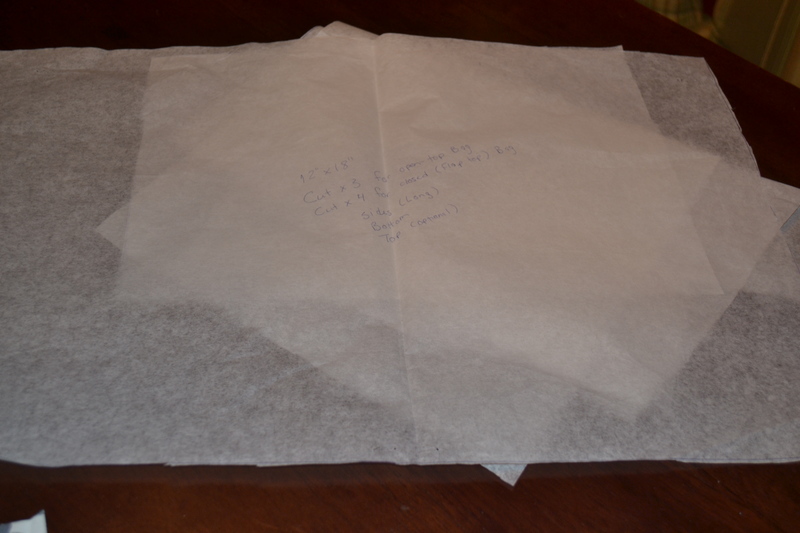 First I stitched around the edges of the burlap to keep it from fraying. I then sewed the strips onto the burlap creating a casing on both ends. 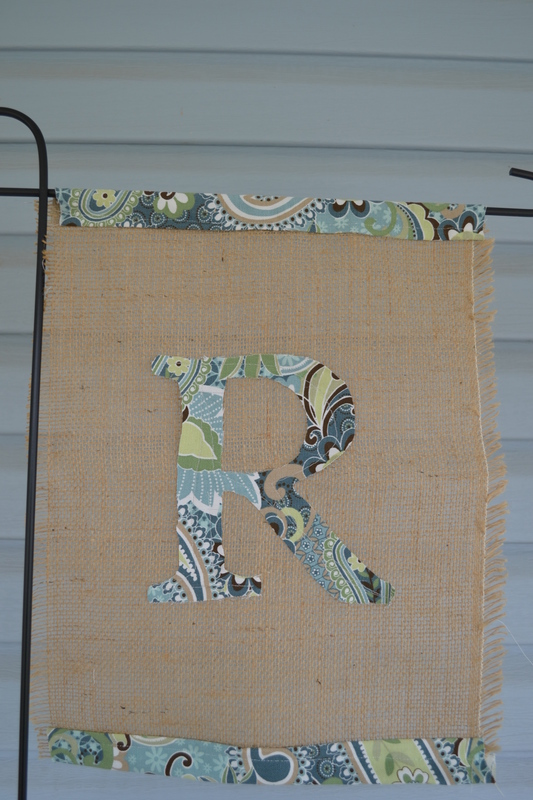 I stitched the R onto the middle of the burlap. That’s it! This project didn’t take very long at all and was inexpensive. Now I gotta make me one!! 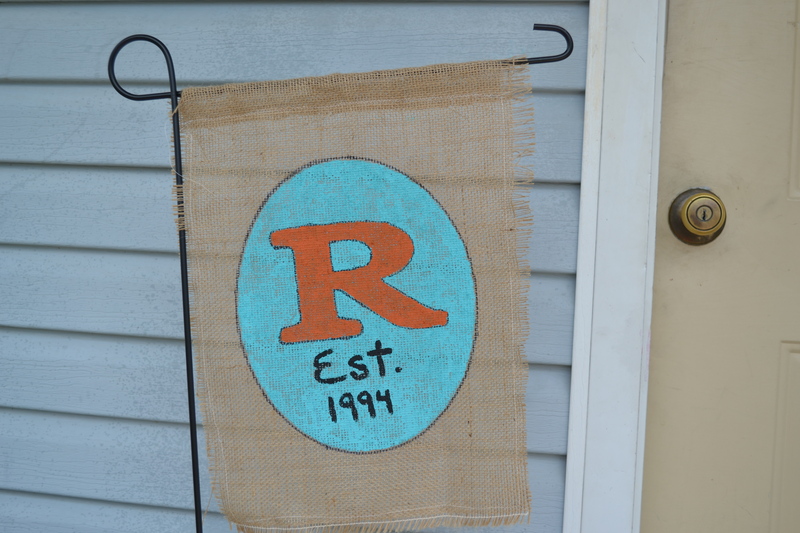 Okay so I have been seeing all these cute burlap flags and decided to make one. I just bought a few yards of burlap fabric and used some fabric paint for this simple flag. I just used a 12 x 18 inch piece of burlap, frayed it just a bit around the edges (by pulling the strings out at the edges), then sewed around the edges with some heavy duty thread. I created a casing at the top about 1/2 inch wide so it would slide onto my flag holder. I then used a large size Sharpie to trace around an oval cut out I had, then painted the oval a teal color, traced an R in the middle of that, painted it in with a burnt orange color. I then freehanded the Est. 1994, (which kind of looks like a little kid did it. but it’s all good) in black paint. I think it turned out okay for a first attempt at using the burlap. I am working on another flag that requires a bit more sewing, so watch for that hopefully soon. Sometimes I have these great expectations (okay almost all the time – I am like Clark W Griswold with my overly enthusiastic expectations) and then things do not turn out as I had expected. This flag is case in point, it turned out fine, but not the great expectation I had in my mind. I think in life this happens to us often and we lose sight of the reason we do things to begin with. So, I will just say, I was joyful in the process and that is what really counts. Feeling more content as I am closing this out. I thank God daily for the many blessings in my life. May you all enjoy the blessings God sends your way!! God bless! Baby Gifts- How to Save $$$ While Giving Awesome Gifts! I had a few baby showers as of late and had sat down and made some cute little gifts to go with the diapers I always try to give. I hate just showing up with a boring (but much needed) package of diapers, so I like to add a little something hand made to it. 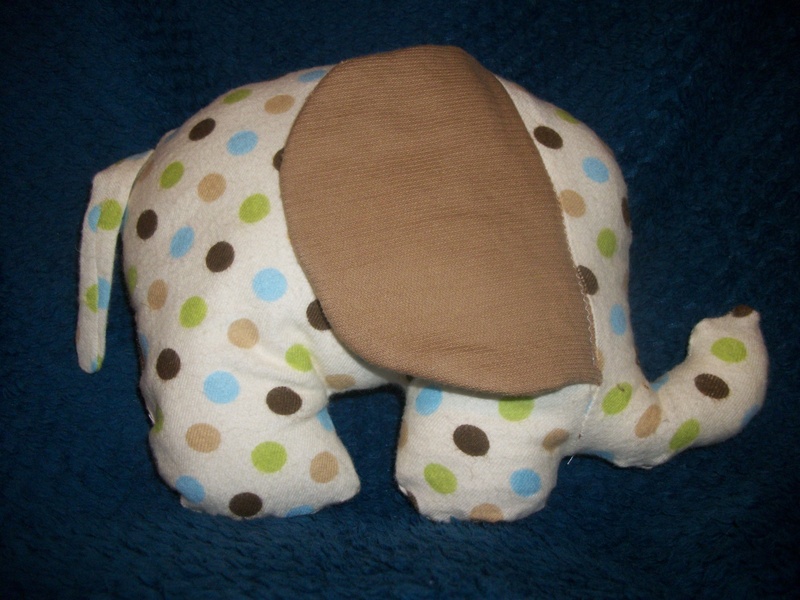 Here the gift was for a baby boy, so I found some cute marked down remnants of fabric, and found a cute free pattern on fabricworm.com for an elephant lovey. It was super easy to follow and I think it turned out great. 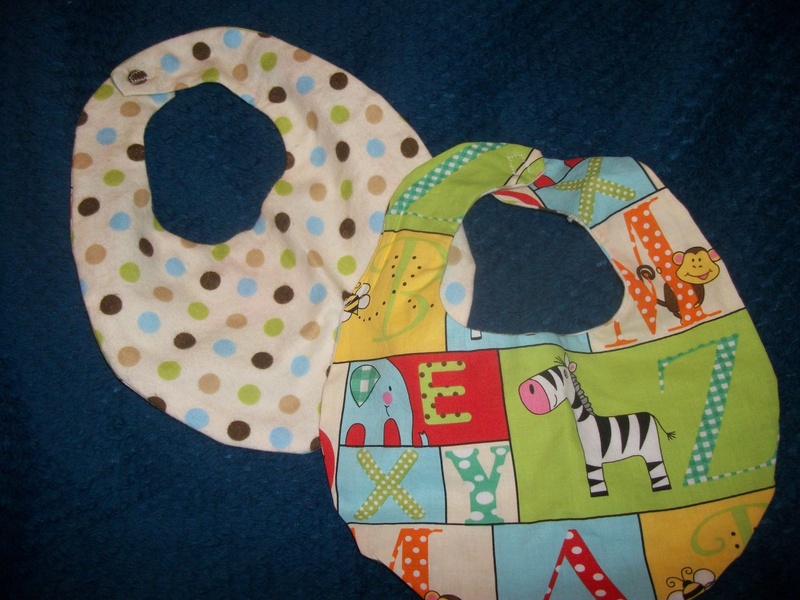 I then sewed up a couple of bibs using the same fabric as a backer as it was soft. I just took a standard baby bib and traced around it on freezer paper. There are tons of free bib patterns out there on different blogs, or you could search Pinterest and find one you like. I added a bit of velcro to these bibs to make em easier to put on and take off. When my kids were babies, they had the tie on bibs, it was such fun to hold your baby still and tie a bib on without getting it too tight or too loose. So there you have it- a great addition to a baby gift without spending a ton of money. 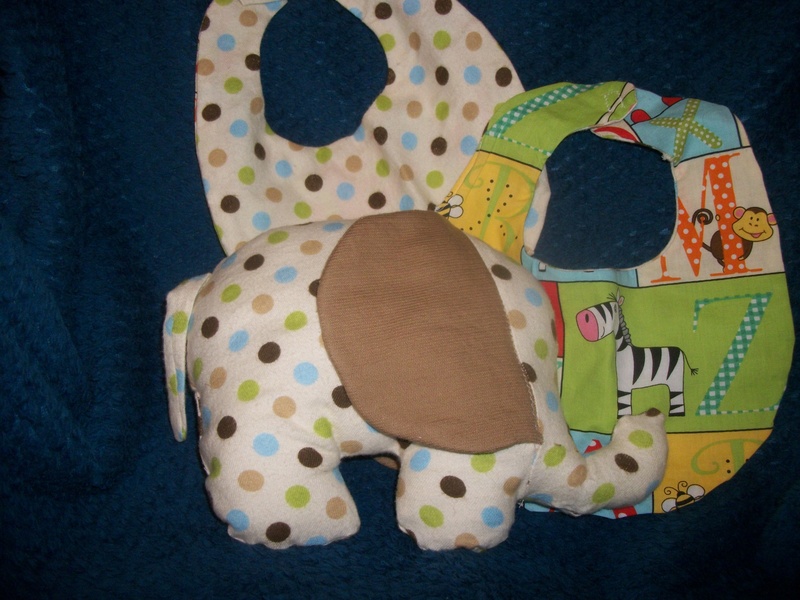 Also, new moms love getting something that you’ve taken the time to create just for their new addition. Happy Weekend! Have a blessed one! My mad sewing skills! 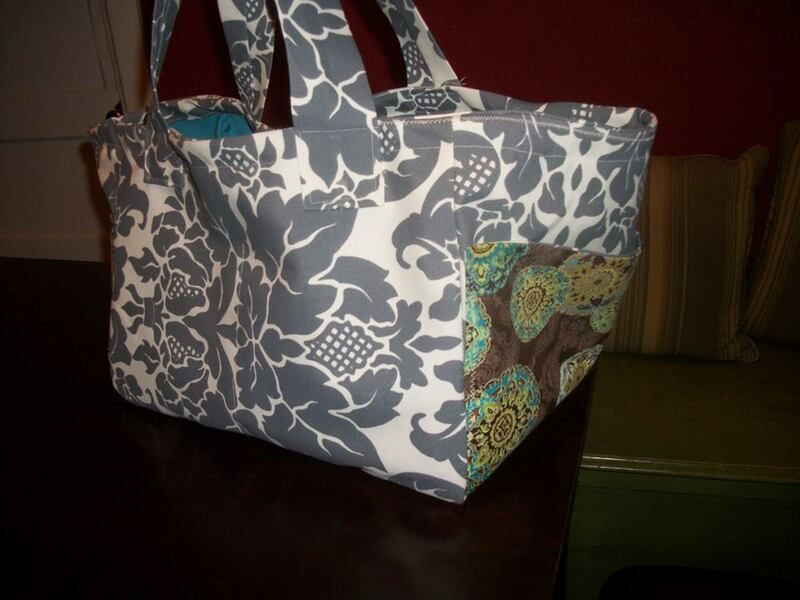 Scraps turned into a nifty tote bag in no time! So I had been wanting a new tote bag from a sales catalog, but being the frugal gal I am, decided to make my own version instead of spending much money. I had a bunch of fabric already on hand, so whipped up this bag. This bag came out to approximately 12″ by 18″, with inside pockets on each side and outside pockets on each end. I made it a flat bottom bag because I use it for travel and it doesn’t tip over this way. This was super easy to make, using only basic sewing skills and basic equipment. The grey and white fabric is a medium weight canvas, then the blue and the print are just basic cotton fabric I got for $1 a yard. For the outside I cut out 3 pieces 12×18, and 2 pieces 12×12, and then pocket pieces were 12×8. I then created in lining using the same measurements, but with pockets being lengthwise instead of width wise. So the pockets for the inside were 18×8, sewed into 2 large pockets on each side of the inside, for a total of 4 pockets 9×8 each. 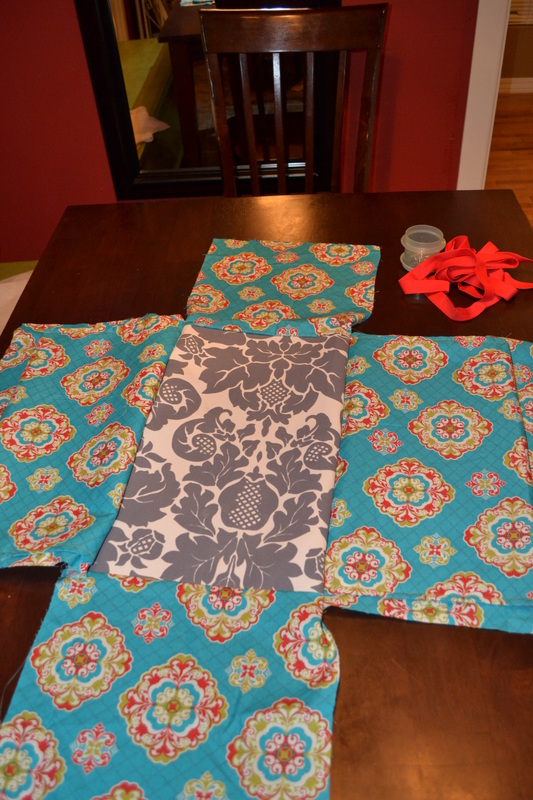 For the strap I just used the canvas fabric and sewed two pieces (26″ long each) lengthwise and turned right side out. For the binding around the top, I just used again the canvas fabric. As you see in the pics, I placed a piece of cardboard into the bottom for shape and stability. By making this bag instead of buying one I saved myself around $25.00, a great way to be frugal and content with the things I have!